Using time-honoured spiritual wisdom and breakthrough scientific research, Dr. Joseph Murphy's book, The Power of Your Subconscious Mind, teaches readers how to achieve the impossible in their daily lives. Dr. Joseph Murphy shows readers that the subconscious can be used to increase health, improve immunities and better one's career through better and consistent improvement. In addition, he presents methods to overcome fears and improve lifestyle, relationships and confidence. 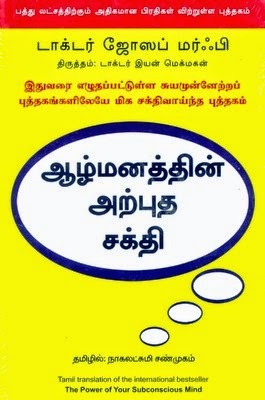 This edition has been translated into Tamil. Dr. Joseph Murphy was a Divine Science minister and writer. He was well known for several works: Miracle of Mind Dynamics, Think Yourself Rich: Use the Power of Your Subconscious Mind to Find True Wealth, Believe in Yourself and Think Yourself to Health, Wealth, & Happiness among them. He obtained his PhD. in Psychology from the University of Southern California. He died in 1981.